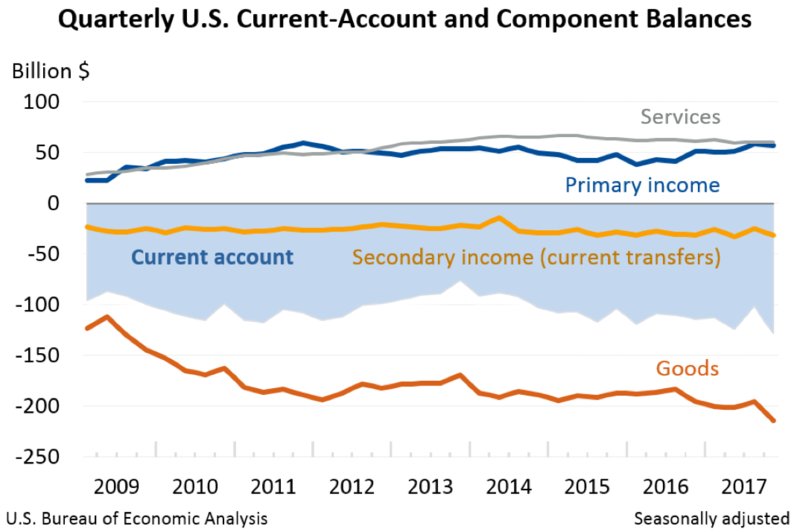 The current account deficit has increased from $452 billion in 2016 to $466 billion in 2017, while the trade deficit rose from $504.8 billion to $568 billion over the same period. These widening deficits provide the background for President Trump’s wrath over what he considers unfair trade, and we have seen recently the launch of the first salvoes of what could become an all-out trade war. However, there seems to be a great deal of confusion and misunderstanding regarding both the composition of the U.S deficits, as well as the causality. In particular, the focus of the Trump administration, as well as many politicians and policy makers on the trade of goods deficits misses the important role of services in the Unites States’ external accounts. The balance of payments and current account includes the exports of both goods (tangibles) and services (intangibles). The services include such items as transportation, travel (tourism), financial services, insurance, intellectual property (IP), software and entertainment) and consulting services. Travel, financial services and IP account for approximately 56% of the U.S. total exports in services in 2017. Exports of services account for a third of our exports of goods and services. 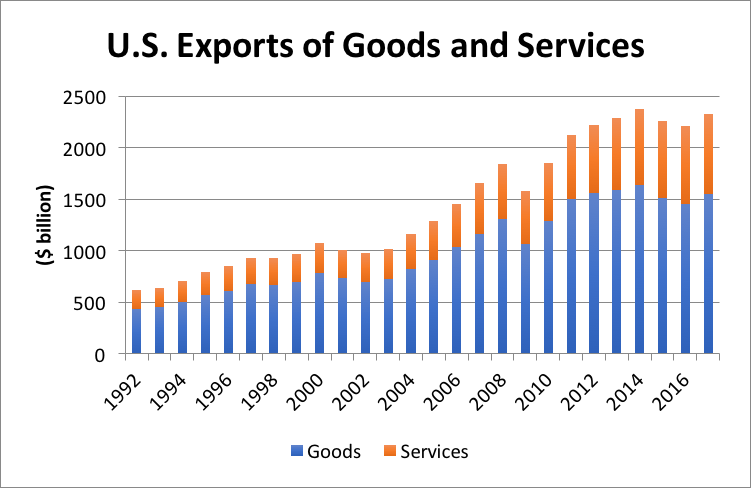 Moreover, the share of service exports in total goods and services exports has steadily increased in the past 25 years from 28.7% % in 33.5% in 2017. Over the past 25 years, total goods exports have increased by over 250%, to $1.550 trillion in 2017, exports of services have increased at a faster pace, rising by 340% (to $780 billion) over the same period. 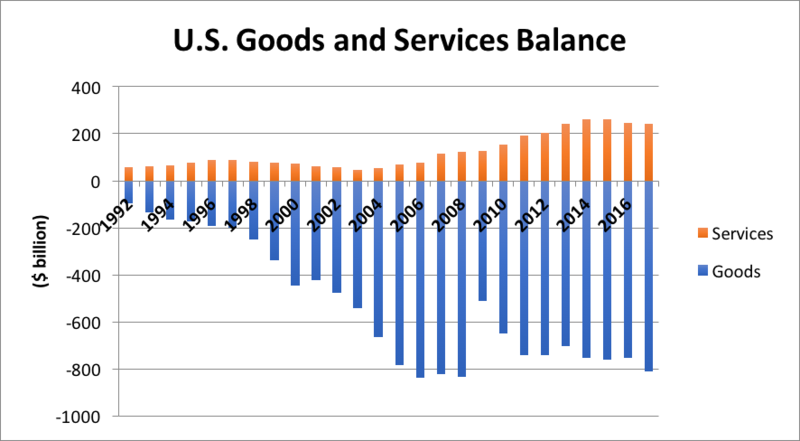 While the balance of trade in goods is negative, the United States runs a large surplus in the trade in services, reflecting its global comparative advantage in this sector. This surplus reached $242 billion in 2017, offsetting about 25% of the deficit in the trade of goods. Note that these numbers do not include net income (dividends and interests) from the U.S.’s positive international net asset position. The U.S. largest trading partners in services are. In order, the European Union, the UK, Canada, China, Japan, and Mexico, accounting for over 50% of the total. The Trump administration should keep these points in mind before it unilaterally expands the scope of its trade moves on the imports of goods.The U.S trade deficit is structural, resulting from the chronic gap between country’s savings and investment. Therefore, protectionist measures cannot reduce significantly the goods trade deficit. Furthermore, the U.S.’ major trading partners, in particular China, are likely to retaliate in the both the goods and services areas, with potentially significant negative consequences for the service sectors of the economy in which the U.S. holds a clear competitive advantage.Instead, the U.S. should focus on a multilateral approach to opening up the Chinese (and other major markets) to the U.S. services alongside with U.S goods. The macroeconomic equation is: NX=I-S, where NX stands for Net Exports (trade balance), I for investment and S for Savings. As long as the United States government runs a fiscal deficit (which will widen as a result of Trump’s economic policies) and private savings rate remain low, the country will run a deficit.